I am so excited to share that I was chosen as a Crain's Chicago Business Model!! What an honor and fun opportunity for me to share some more style wisdom when it comes to dressing for work. Head over to Crain's Chicago to check out the article and the gorgeous shoot I did with the talented Shane Collins! We shot it on a perfect Chicago day at Navy Pier and let's just say it made me love my city even more, if that's even possible. PS. You will have to subscribe to Crain's (it's free!) to view the entire article and photo shoot. To my fellow Chicago fashionistas/os, share your work style on Instagram with #ccbstyle for a chance to be the next Crain's Chicago business model! Wow, so cute! Congratulations! Can't wait to see what other looks you put together! Congrats! Also I am in love with your yellow skirt. It is so pretty paired with your chambray top. Congrats! 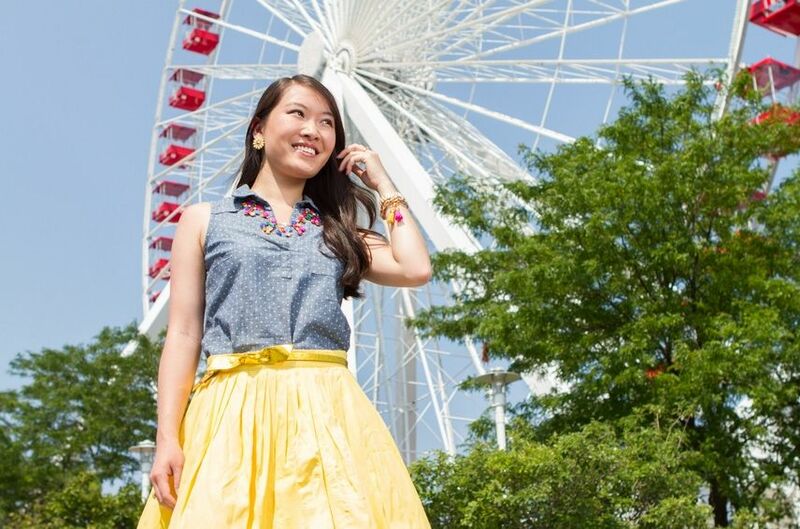 !Adore that yellow skirt - it's so perfect for summer! So lovely!! Such a pretty look! Congrats! That's so awesome and I LOVE that yellow skirt! I love the bright yellow skirt!